If it seems impossible that Venezuela’s government could have remained in power nearly two years into the country’s self-imposed economic collapse, consider that Naunihal Singh, a leading expert on power transitions and coups, is just as baffled as everyone else. A hint as to why the crisis has stretched on lies in the growing dispute over legitimacy, just the latest sign of a monthslong deadlock over the country’s future. Both Nicolás Maduro, the president, and Juan Guaidó, an opposition lawmaker who has pointed to Mr. Maduro’s widely disputed election victory, claim to be Venezuela’s legitimate leader. Military leaders, political elites, protesters and foreign governments have all weighed in. Disputes like this often emerge when countries face crises that can unseat the government. But they are not really about legitimacy, experts say. Rather, they are elaborate games of maneuvering and signaling among military leaders, civilian leaders and foreign governments who have the power to determine the country’s fate — but only if enough of them can come together to force their way. When those powerful actors consider their options — a coup, a unity government, a peaceful transition, or reinforcing the status quo leader — they choose whatever will secure their interests and win enough support from other powerful actors to succeed. “Legitimacy is used to wrap a bow on an option afterward, rather than to select the option,” Professor Singh said. That process has broken down in Venezuela. The political establishment is fractured. Foreign governments, including the United States and Russia, hold conflicting, zero-sum agendas that prevent them from coming together. Even Venezuelan citizens — who would have to be sold on any new government for it to survive — remain divided. Some, particularly among the poor, still back the ideals of Mr. Maduro’s mentor and predecessor, Hugo Chávez. And although some in the military support Mr. Maduro’s ouster, its leadership has reiterated its loyalty to him. Leaders like the shah of Iran and Hosni Mubarak of Egypt, for instance, fell from power when enough of their country’s powerful actors came together to remove them, seizing on civilian unrest to portray them as having lost legitimacy. The protesters who filled the streets of Caracas last week, and Mr. Guaidó, are portraying Mr. Maduro as illegitimate. But for now, Mr. Guaidó has not convinced enough of the power brokers that he is a credible alternative. The many crisscrossing claims can make it difficult to draw a clear line between what is legitimate or illegitimate — between a revolution or a coup, between democracy being saved or subverted. 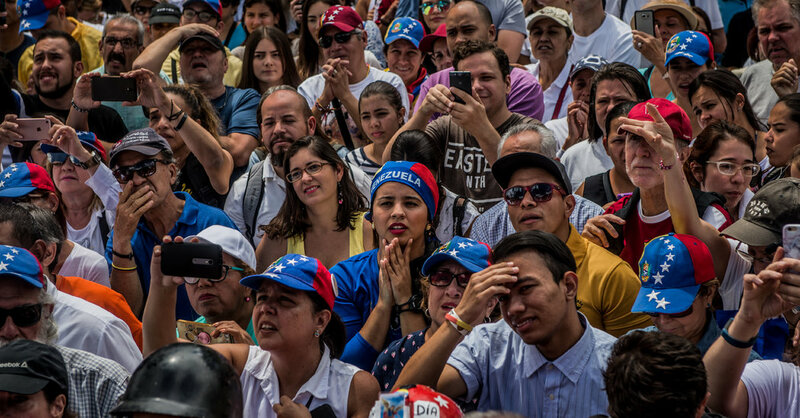 The result is paralysis, with Venezuela’s government surviving nearly two years after its collapse was widely declared inevitable and with the country drifting ever deeper into a crisis. The complex gamesmanship among Venezuela’s leaders is clearest in their competing appeals for the loyalty of the military. Such signals can be more credible when made publicly, binding those offering such assurances to their word. But Mr. Maduro may have more to offer. He is thought to have granted the military control of drug-smuggling routes among other income sources. This also makes it harder for officers to defect, knowing that a different government could bring criminal prosecutions. It’s a time-tested tactic. When the president of Gambia, a small West African country, refused to step down after losing 2016 elections, citizens, elites and foreign governments turned against him. But the military stuck by him, in part because he had used those forces to crack down, exposing the brass to jail time if he ever lost power. The military’s vote was so decisive that the crisis was resolved only when nearby countries invaded. This is why appeals to the military often include both an offer of amnesty and a promise to deliver the support of foreign powers. Venezuela’s military leaders could view the medium of Mr. Guaidó’s message — an American newspaper — as a message that he has sway with the Americans. Still, both Mr. Guaidó and Mr. Maduro have weak enough positions that neither can fully guarantee the military’s future. Even as some officers have rebelled, raising fears of a full-blown mutiny, the generals have not jumped to Mr. Guaidó. But Mr. Maduro appears to feel his grasp on them is tenuous enough that he has not called troops into the streets to put down protests. Militaries are not always the ones to resolve crises like Venezuela’s. In many cases, foreign allies or mediators step in. Even when militaries do decide the outcome, they often seek the blessing of foreign powers who can ensure that the new government will be welcomed as legitimate. When the United States declared Egypt’s president no longer legitimate in 2011, the military correctly took that as a signal that it could oust him without angering the Americans. Zimbabwe’s military is widely suspected to have sought approval from China, a major investor, to remove President Robert Mugabe in 2017. But Venezuela is pulled between two sets of foreign governments that want very different things, making it nearly impossible for any Venezuelan leader or group to have confidence that it will win international approval. On one side, the United States and a number of Latin American countries, including Brazil, Venezuela’s largest neighbor, have declared Mr. Guaidó the interim leader. On the other are Cuba, a longtime ally, and Russia, which support Mr. Maduro. For foreign powers to recognize Mr. Guaidó can feel like a major intervention, even a coup, by essentially picking Venezuelans’ leader for them. But foreign governments typically do this to signal to the country’s military and civilian elites that they’re fed up with the leadership and willing to treat a new government as legitimate. That’s important to elites who want to hear that any transition will bring them stability and economic relief. But after the Trump administration was reported last year to have discussed coup plans with rebel Venezuelan officers, American intentions may be seen as too suspect for Washington to credibly guarantee any political transition or mediate a peaceful resolution. The Russian and Cuban governments have more sway with Mr. Maduro, but their opposition to right-wing Latin American governments undermines their credibility among others in the political class. And those countries’ larger conflicts with the Americans make it difficult for the powers to come together, robbing Venezuela of an impartial mediator. No leader is all-powerful. He or she must always rule through networks of party officials, political power brokers and business leaders, who together constitute the civilian elite. At times, that class of people can persuade or force their leader to change course. Business elites in apartheid-era South Africa, fearing that international isolation would destroy the economy, helped convince the leadership to transition to democracy. But Venezuela’s ruling class has been unable to come together, either in support of Mr. Maduro or in opposition to him. The international deadlock means that none of Venezuela’s power brokers can credibly promise the rest of Venezuela’s elites that they will win consensus among world leaders for any plan — making virtually any move seem too risky to pursue. Years of polarization between the political right and left, whipped up by Mr. Chávez, have divided Venezuela’s governing class. Even if few are happy with the status quo, years of distrust make it difficult for them to cooperate. And it may make members of Mr. Maduro’s leftist government fearful of a rightward turn should they allow a change. Even if a crisis like Venezuela’s is worked out among elites and governments, they still know that they have to sell any outcome to the country’s citizens. That can work well enough when those power brokers all agree and can create legitimacy after they’ve acted. In Egypt’s 2011 revolution, protests did not topple the president on their own. Military brass, foreign allies and certain civilian power brokers all signaled to one another that they could accept an interim military takeover. Only afterward did they use the protests to legitimize their decision. But when those elites and governments are deadlocked, as in Venezuela, they can appeal to citizens to rally behind them. That’s not enough to win power, but it can convince others in the ruling classes that whoever commands popular support can deliver peace and stability. Would-be coup leaders are much less likely to topple a government that they believe has popular support, Professor Singh said he has found in his research, for fear of sparking unrest. Mr. Guaidó and Mr. Maduro’s competing legitimacy claims are aimed, in part, at rallying supporters in a kind of show of political force. This exposes an uncomfortable truth about when a change in government is legitimate.